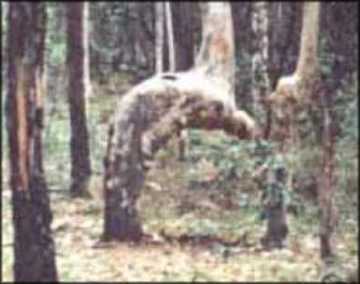 "Tree Resembling Man in Prayer. This is a recently discovered phenomenon in a forest near Sidney. As you can see, the bottom half of the tree trunk is bowed in such a way that it resembles a person in a posture of Islamic prayer - the 'ruku'. Looking closer you can see the 'hands' resting on the knees. The most amazing thing is that the 'man' is directly facing the Kaaba, Mecca, which is the direction Muslims all over the world face when in prayer." Trees do not have heads and arms to stand in prayer as these naive Muslims claim. Trees bend in different shapes. Using my imagination I can see another tree looking like a man with a very tall neck (the head is not shown in the picture) standing in front of the "praying" tree or walking towards the camera. It seems that the first tree is bowing in front of him or may be praying to him. But I may be wrong, perhaps this tree just happened to be walking towards the photographer while the other one was praying. Muslims scholars have different opinions about this picture. Some opine that the tree is watching the Australian ants walking under its feet, others say that the tree is bowing out of respect of the other tree but the majority and the most credible scholars of Al Azhar affirm that the tree is praying. My personal view is that they are all wrong and the tree is simply bending under the pressure of the huge hump that has grown on its back. Ouch! That must be excruciating! However, I guess we shall never know the truth unless we go to Australia and ask the tree. P.S. After the above picture was released many Muslims were attracted to go to Australia and take a close look at this pious tree. Unfortunately what a friend of mine found shocked him. This is the picture that he took. He was dismayed to see that a dog and a pig had gathered around the tree thus annulling its prayer. Now the tree has to perform Qosl and vodoo before it can continue with its salat, but because it cannot walk, the poor thing has to wait until the next rain. 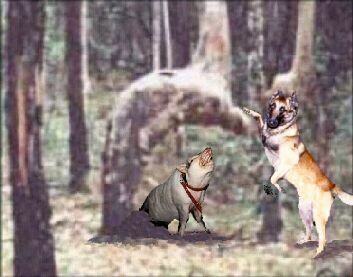 Upon investigation my friend found that the dog and the pig pilgrims had gone to Australia to ask the tree to plead Allah on their behalf to remove them from the list of najis (filthy) creatures.